I read this years ago and remembered really liking it. Since I've been wanting to read the rest of the series (there are 6 books in total), I thought it was time for a reread. And I LOVED it. It hit all my book buttons and now i'm itching to start book two. This book gets a lot of comparison to Diana Gabaldon's Outlander (Gabaldon herself wrote the blurb on the cover of Into the Wilderness!) and I think that is fair to a degree. Both feature strong willed female characters, interesting (and somewhat similar) time frames and places, adventure, romance, and lots of drama. A few of Gabaldon's characters even make cameo appearances! Despite all this, they are very different novels and both highly enjoyable reads. 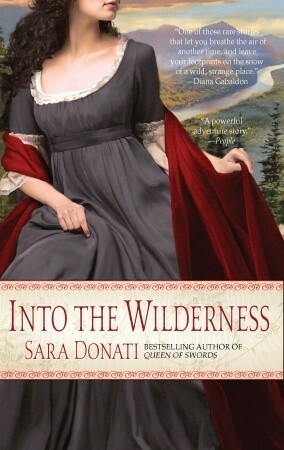 If you are a Gabaldon fan, or enjoy historical fiction, check this out! When Elizabeth Middleton, twenty-nine years old and unmarried, leaves her Aunt Merriweather's comfortable English estate to join her father and brother in the remote mountain village of Paradise on the edge of the New York wilderness, she does so with a strong will and an unwavering purpose: to teach school. It is December 1792 when she arrives in a cold climate unlike any she has ever experienced. And she meets a man different from any she has ever encountered - a white man dressed like a Native American, tall an clean and unsettling in his blunt honesty. He is Nathaniel Bonner, also know to the Mohawk people as Between-Two-Lives. As Judge Middleton brings pressure to bear against his daughter, she is faced with a choice between compliance and deception, a flight into the forest, and a desire that will bend her hard will to compromise and transformation. Elizabeth's ultimate destiny, here in the heart of the wilderness, lies in the odyssey to come: trails of faith and flesh, and Nathaniel's own secrets and divided soul.